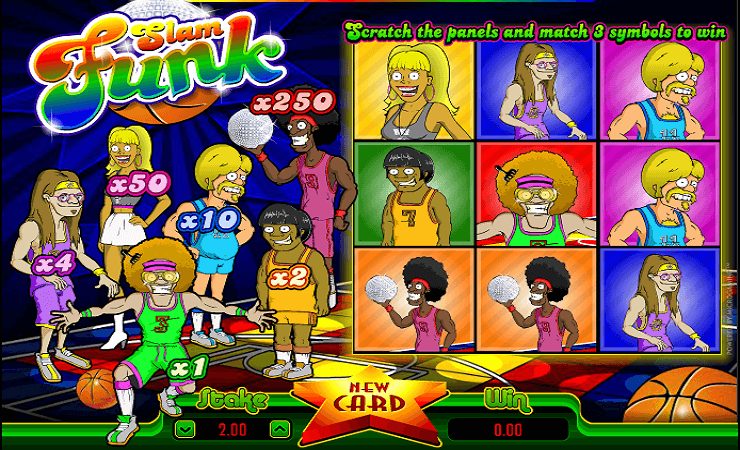 Slam Funk scratch card game by Microgaming is a classic example of the genre, and contains all of the features you can expect from instant lottery games. The theme is about basketball and disco nights of the 80’s – an interesting mix-up. Basically, imagine basketball players from the 80’s in a disco setting, welcome to the Slam Funk. The graphical quality is good and the art style represents the odd theme of the game perfectly. As with all classic scratch card games, you need to match three of the same symbols to get paid. How much you win depends on the multiplier level of that symbol. In Slam Funk, payouts depend on multiplier levels of the symbols. There are six symbols in total, which are represented by different basketball players. Each one has a different multiplier value, from x1 to x250. For example, if you manage to match three x250 player symbol, you get paid 250x total bet. Because of this, playing with the maximum bet levels is important. The bet levels change between 0.50 and 10.00 coins, and since the payouts are the multipliers of that levels, we advise you to play with 10.00 coins all times. (The maximum payout is 2.500 coins.) To start the game, simply click on the “new card” button. There are six different slots to scratch, which you can do by yourself or reveal all by clicking on the button with the same name. As we said above, you need to get three of the same symbols to win. The game has a very fast pace and each round lasts mere seconds. You can also play the game on your mobile device, the interface scales perfectly according to your resolution. You get 100.000 complimentary coins in the demo mode, so you can play literally for hours even if you keep losing. Although, the payout frequency is high – we got dozens of small wins (x1 – x2) during our review play. The maximum payout is lower than the usual, but classic scratch cards games close that gap by offering lots of small time wins. Slam Funk scratch card game is good for rainy days, but don’t expect anything innovative. Play at Casino Avenue to find the innovative ones!